In most work object forms based on Review and Confirm harness rules, an operator can select the Start New Process button to start a new flow execution on an open work object. By default, the operator can select any flow in the inherited work classes that that can be added to a work object. This capability is available when the Can be added to a work object? 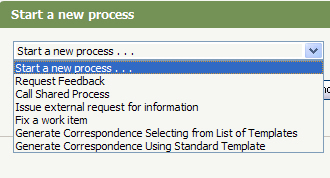 option is selected on the flow rule's Process tab. You can customize the list to exclude flows that are not relevant to a work type by adding a case type rule ( Rule-Obj-CaseType ) in the Applies To class. Using the rule simplifies the presentation and reduces the possibility that an operator will start an inappropriate flow. 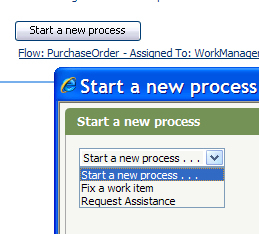 In this example, the Purchase Order flow (in the work class AlphaCorp-OrderEntrySystem-PurchaseOrder ) initially displays the following list of available new processes. The list includes flows in Work- class. You want to include only the Request Feedback and Fix a work item flows, which are in AlphaCorp-OrderEntrySystem-PurchaseOrder and exclude the others. Create a case type rule in the Applies To class. The Purpose is pydefault (cannot be edited; there can be only one instance in a class). On the Processes tab In the Process to Start section, add a row and use Smart Prompt to select the flow you want to include. (The list ignores the Can be added to a work object? option on a flow rule's Process tab). 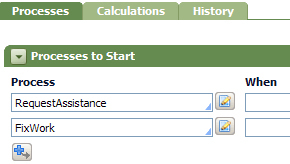 You can add a when rule to determine the conditions under which a flow will appear in the Start a new process pull-down list. Save the rule when you have finished editing it. Values in the case type rule override the default list. If you do not enter any values in the Processes to Start array, no flows appear in the list. If you want to revert to the default behavior, delete the rule. A case type rule in a parent work class applies to all classes inheriting from it. Create a case type rule in the child’s Applies To class to override the rule in the parent class. For example, flows in the AlphaCorp-OrderEntrySystem case type rule are available in a AlphaCorp-OrderEntrySystem-PurchaseOrde r work object. Add a case type rule to AlphaCorp-OrderEntrySystem-PurchaseOrder to specify its own list of flows and those in other sibling classes.